The Samsung SPC-1010 is a PTZ Control Keyboard which allows you to control the operation of the PTZ and Zoom camera series, and the SRX-100B Receiver. You can control up to 255 cameras via the PTZ controller. The pan, tilt, and zoom operations are controlled via a 3-axis joystick, and zoom, focus, and iris operations can be controlled via the controller buttons. In addition, support for different protocols such as Samsung-T, Samsung-E, Pelco-D, Pelco-P, Panasonic, Vicon, AD, and Honeywell is also provided by the PTZ Control Keyboard. Serial communication is enabled via RS-485 and RS-422. You can use the controller with preset, swing, and group cameras. An OSD menu is also provided, and a 9V battery can also be used to power the controller. It includes a PTZ controller, power adaptor (12V), and a terminal block. 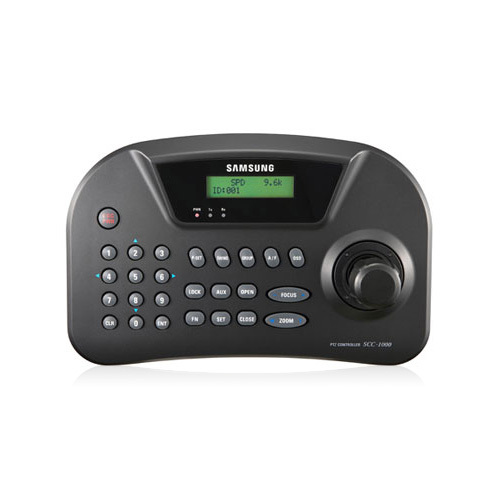 The Samsung SPC-1010 has many exciting features for users of all types. 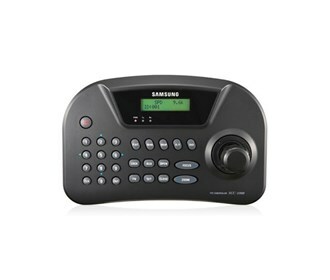 See the Samsung SPC-1010 gallery images above for more product views. The Samsung SPC-1010 is sold as a Brand New Unopened Item.